The only version of the Penobscot design that has the back bow strings go over the tips of the back and then attach to nocks near the grip is the Micmac War bow. All other Penobscot bows have the back bow strings on nocks at the tip of the back bow. The graph is a comparison of the force draw curves for a static recurve Penobscot bow with the draw weight set at 60 and 65 pounds (Solid lines). The dotted lines show the curve for a 55 pound flat bow and the one that shows let off is a 60 pound Martin Warthog compound. The numbers at the right of the graph represent the # of squares (Stored energy) below each graph. Penobscot bow at 65 pounds = 166 at 60 pounds = 139 The 60 pound Warthog = 137 and the flat bow = 105. When I did the graph I was rather suprised at the results. Bye the way Bowmo, that is one cool looking Penobscot bow and the tiller looks great! One tip on tillering these beasts, I have it works best if you make the lower limb on the main bow 2" longer then the upper limb. If a limb is going to take a set it will be the lower limb. I will try to pst a few pictures of the different bows. The brush nocks on the static recurve are my addition, this bow is Osage and the brush nocks are Claro walnut. 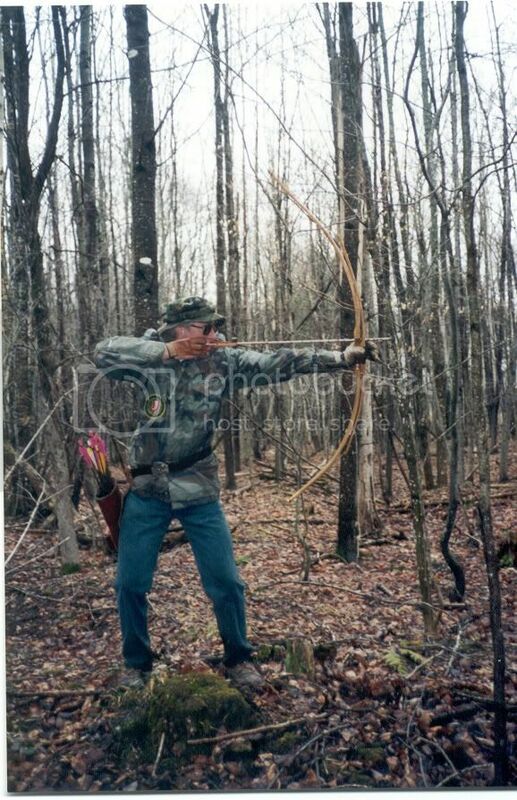 The next bow down is a slight recurve made of Hornbeam and is the bow that was on the cover of Primitive Archer Magazine. The bottom bow is a mild reflex deflex. 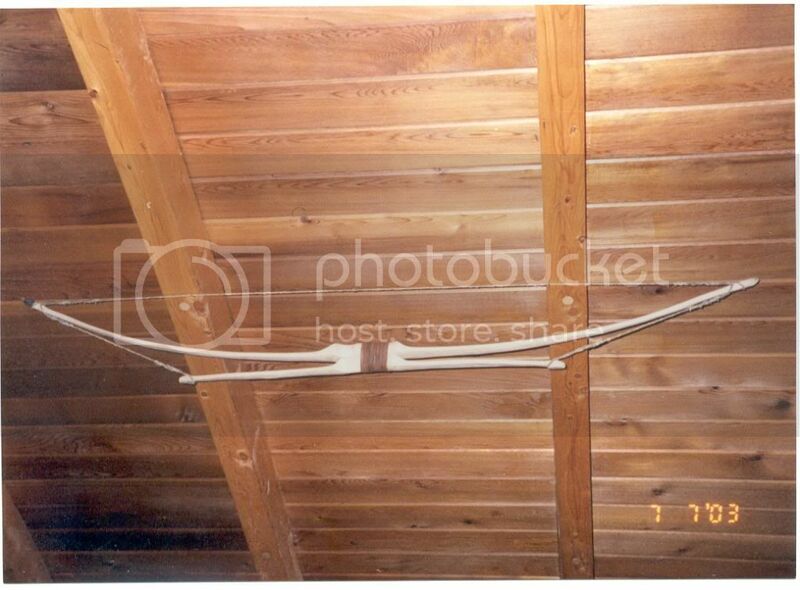 The next picture is the bow I made for Kracow Archery befor it had any finish on it. This bow got a sinue bow strings as the origionals had but I am sure the sinue was not from the back of a moose as the origionals were. This style is the second oldest and the main bow is a pyramid design flat bow and the back bow is flat with no reflex. On the oldest style the main bow was a more conventional design sort of a modified Mear Heath design and the back bow wae longer(2/3) the length of the main bow. 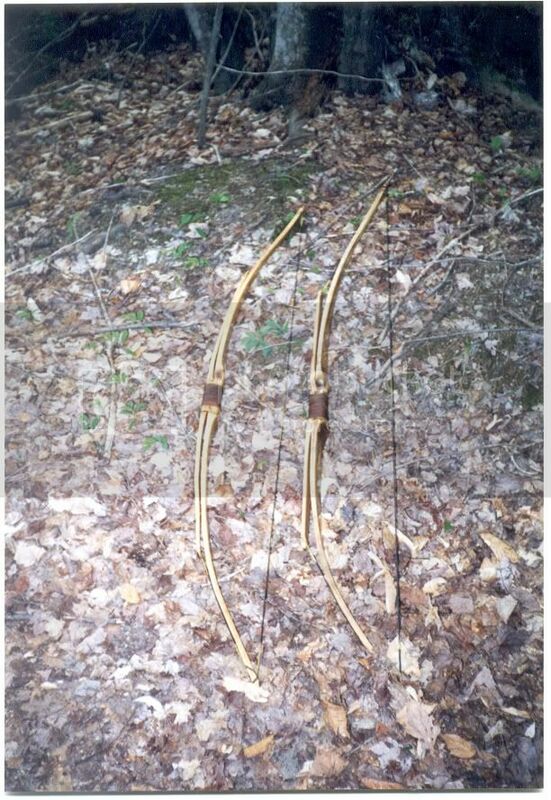 These bows also had the lightest back bow which bent parallel to the main bow. I will try to post a picture of one. yup any one of those three will do just fine,should i PM my address to ya,or are you just going to get it from danam? i always wanted a harley,untill it became the "thing to ride"
once i feel i am up to the task at hand i have got to try and make myself one of them. i still gotta say, even the earlier versions are still incredible looking and designed bows. have you found any particular type of wood that works better than others for this design? i may have to get in touch with you in the future when i feel i am ready to try one of these out for myself. If any of you want help building one of these bows please feel free to contact me!!! 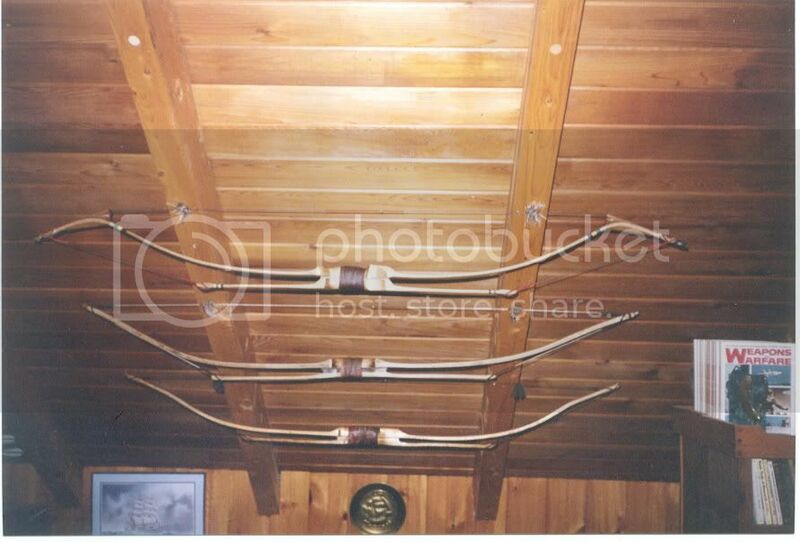 I have talked several people through building and tillering these bows. Give me a call with your questions my # is 207-938-3595 it is the business phone at our custom gun shop and I am usually there from 10:00 till 5:00 but it also rings in the house. Does the wood need to pretty tension strong for these bows or more compression? Also what kinda width do you normally make these, outta like hickory? I'd like to get one of these roughed out. Compression strength is importand on these bows due to the way the limbs are loaded as the bow is drawn. I use a pyramid design for the main bow with even tapper to the nocks the width of the limb depends on the wood used but it is usually around 2"
If you people would like I will do a build along on these bows. Though I own a custom gun shop it is not uncommon to find a bow stave clamped a vice and not a stock blank. 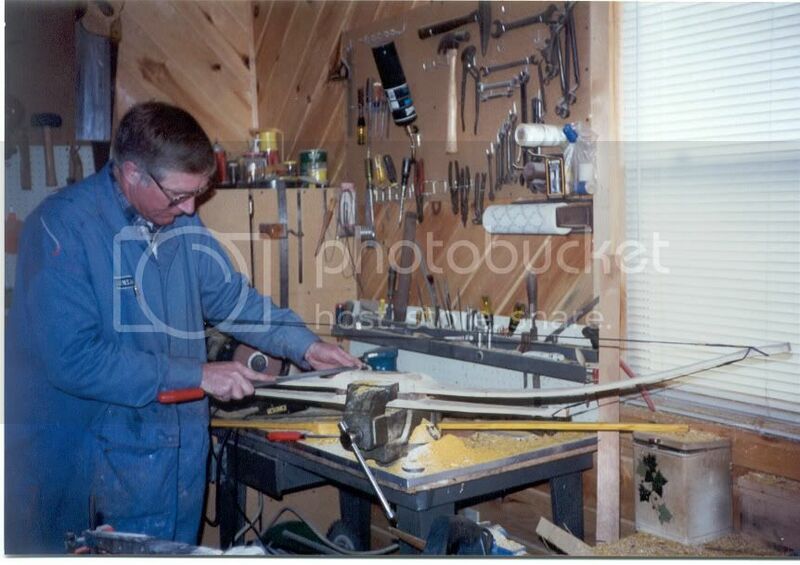 Most of the pictures will be from my work shop in the house like this one which shows my tillering board. This is mounted on a scale so I can get both the draw weight and still step back to check the tiller of the bow. Judson-Very nice work, very impressive! judson, a build-along would be awesome. i've got a candidate (main bow) that could use a back-bow. if i understood you correctly, the main bow is stressed mainly mid-limb to tips. so a (main)bow that's bending too much near the handle should be correctable thru a secondary bow, right? These are really distinctive bows. I've got your Micmac bow bookmarked for January Self Bow of the Month. The Penobscot design is so different and distinctive that it really needs to fit into a separate category Adam Bonney's Orcbow which won BOM for last September. Enter another bow for next month, too, if you wish. With the Penobscot design the lower and mid section of the main bow is where most of the energy is stored. I have found that when tillering these bows it seems to work best if you tiller the main bow to the desired draw weight and length. Then hook up the back bow and retiller to drop the weight back to the target weight. By all means, do a build-along. I'd like to see the process. The Penobscot is a fascinating bow design. is hickory a good wood for this design?